A nine-year-old girl has had a prehistoric beast named in her honour after fossilised bones she found turned out to be an undiscovered species. Daisy Morris from the Isle of Wight stumbled upon the remains on Atherfield beach four years ago. A scientific paper stated the newly discovered species of pterosaur would be called Vectidraco daisymorrisae. Fossil expert Martin Simpson said this was an example of how "major discoveries can be made by amateurs". Daisy's mum Sian Morris said her daughter had started fossil hunting aged three and came across the blackened "bones sticking out of the sand" in 2009, when she was four years old. The Morris family, from Whitwell, approached Southampton University's 'Fossil Man' Mr Simpson with Daisy's finds in 2009. "I knew I was looking at something very special. And I was right," said Mr Simpson. 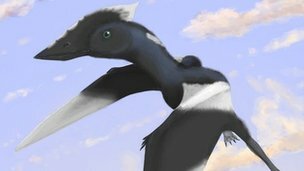 The fossil turned out to be a new genus and species of small pterosaur; a flying reptile from the Lower Cretaceous period. The new species and name was confirmed in ascientific paper published on Monday. Mr Simpson said the island's eroding coastline meant the fossil would have been "washed away and destroyed if it had not been found by Daisy". Mrs Morris, a teaching assistant, said: "She has a very good eye for tiny little fossils and found these tiny little black bones sticking out of the mud and decided to dig a bit further and scoop them all out. "We are all very proud of her". The pterosaur has since been donated to the Natural History Museum which recently named the Isle of Wight as the "dinosaur capital of Great Britain". The confirmation of Vectidraco daisymorrisae comes a week after the discovery on the island of an almost complete skeleton of a 12-feet long dinosaur. Pterosaurs were flying reptiles that lived in the same time period as dinosaurs, up to 220 millions years ago.